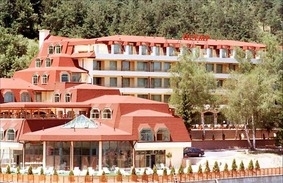 Location: The cozy and comfortable Park Hotel Olymp is located in the resort town of Velingrad, in the heart of the Rhodopi Mountains. Accommodation: The Hotel offers 31 apartments, 8 luxury apartments, studios, presidential and family apartment, 10 double and 20 single rooms. All rooms and apartments are furnished with satellite TV and Internet, direct telephone line, mini-bar and balconies. There are 45 rooms for non-smokers and a paring lot, that can accommodate up to 60 cars at guests' disposal. Conference Facilities: For congress activities, conferences, workshops and other similar activities Park-hotel “Olymp” offers two entirely equipped conference halls – spacious and comfortable with natural lighting. Wine & Dine: Olymp Restaurant offers 150 seats and Summer garden – barbeque with 80 seats. Dishes and special meals from the Bulgarian and European cuisine. Great place place for family celebrationss, business meetings and cocktails. There is also a lobby-bar and a tavern at guests' disposal. Spa & Wellness: Park Hotel Olymp Spa Centre offers more than 125 procedures - therapies for the body, various types of body massages, physiotherapy, face cleaning and lifting, aromatherapy and many other procedures. At guests' disposal are an authentic Roman bath, sauna, solarium and an infrared sauna.